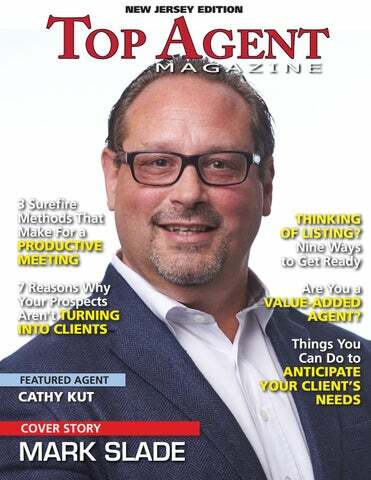 Top Agent Catherine Kut, B and Manager at Realty Exec Exceptional Realtors in S New Jersey has spent more three decades dominating th estate landscape in The G State. Possessing a wealt knowledge and a fierce de nation to provide the very b CATHY KUT client service to all her many buyers and sellers, Catherin true advocate for anyone needing real estate assistance. Things You Can Do to Anticipate Your Cleint’s Needs First and foremost, the real estate industry is a customer service business. The key to any successful real estate business is one that can build a reputation by providing an unsurpassed level of care. That usually means a transaction that is seamless and stress-free as possible throughout the whole process. Your client’s experience is what keeps them not only coming back, but gets them to recommend you to their friend and family. tise. By showing you can not only anticipate their needs, but have insight into any potential problems that might arise, they will have complete confidence in you. Achieving that level of trust is the key to a transaction that is as stress-free as possible. goals, but who they are as a person. Listening and asking the right questions from the start is one of the most important aspects of the job. You almost have to become an amateur psychologist, really honing in on the emotional reasons behind their real estate transaction. Taking time upfront not only gives you valuable insight into your client, but it is the first impression your clients have that you truly care about them, and that this isn’t just another commission check for you. This goes miles in helping them feel comfortable enough to rely on your guidance. Knowing who your client is on a deep level will help you navigate the transition ups and downs, allowing you to anticipate the best way to handle it. likely to delay the process. Remember you are in charge. You are the expert. And, remember, part of avoiding potential problems is making sure your client knows what to expect upfront, always communicate openly and honestly. Telling people what they want to hear and knowing you can’t deliver it, is destined to fail, and will always reflect poorly on you. FIND WAYS TO EXCEED EXPECTATIONS Recognizing ways to exceed a cus-tomer’s needs is just as important as looking out for potential problems, when it comes to creating an exceptional experience. Have a vetted list of trusted service providers. Be hands on. There are Realtors® who are out there helping clients pack, mowing lawns, and picking kids up from school. They are there for a client in ways that are unexpected. Having one thing taken off your plate during a stressful period in your life can feel like a lifesaver and is not soon forgotten. It is those “little” things that will turn a client into a lifelong advocate for your business. truck that has become a brand icon for himâ&#x20AC;&#x201D;the truck makes an appearance at most of his community activities. Mark takes pride in the fact that his team reflects the diversity of the community they serve. For the future, Mark hopes to continue making a positive difference in the lives of his clients and his community and his team. With his enthusiasm, drive and expertise, heâ&#x20AC;&#x2122;s sure to make that dream a reality! To find out more about Mark Slade, email sladehomes@gmail.com, call 917-797-5059, or visit goodhomesforgoodpeople.com www. The truth is, it takes intentioned planning to make a meeting a success. A well-curated meeting makes partners and employees feel unified as a team, excited about whatâ&#x20AC;&#x2122;s to come, and motivated to achieve a collective goal. With that in mind, consider a few approaches below to maximize your next meeting and ensure that all parties involved leave with a renewed sense of direction and inspiration. 1. Create a detailed agenda in advance Oftentimes meetings are scheduled with a loose goal in mind—to hash out the terms of a contract or to strategize a new marketing campaign, for example. To ensure your meeting is productive, time-efficient, and achieves its end, create a detailed agenda in advance. This means breaking down your overarching goal into pieces and outlining what’s required to complete each component. You might also consider making time blocks for each respective component, so there is a clear structure and hierarchy in place. Not only does this ensure that time is used wisely and evenly, but it also creates order and momentum for the greater task at hand. What’s more, you’ll want to distribute this detailed agenda in advance of your meeting, so that all attendees will be familiar with the format and delineated goals of your gathering. This will set a professional tone, while keeping team members and conversation on task. points separately. Once you’ve achieved the highest priority goals of your meeting, you can then return to the items in your holding area. Note: be sure to familiarize your staff with this approach so that the expectation is already in place and interruptions won’t distract from your meeting’s true intent. 3. Conclude every meeting with a brief summary and action items The very last thing you should do before concluding your meeting is to reemphasize the main takeaways of your gathering and outline a specific list of action items. Again, successful meetings are clear and give attendees a sense of direction. That’s why reiterating action items—or next steps in need of completion—to each respective employee is an essential component of a productive meeting. Likewise, summarizing main takeaways unifies a team’s understanding of what’s important and why the meeting was called in the first place. Ending on a concrete yet proactive note helps launch team members toward the next event in their day and gives them a sense of confidence as they tackle their duties. Meetings don’t have to be a formality or a bore. When planned and executed with incisiveness, they can inspire your talent roster and streamline productivity in your office. Especially in the world of real estate, ensuring everyone is on the same page and doing their jobs effectively is key to success and longevity. Put a little planning into your next meeting, and you’ll save yourself valuable time and energy as you move forward. 7 Reasons Why Your Prospects Aren’t Turning Into Clients Real estate experts suggest prospecting daily so that your sales pipeline never runs dry. But sometimes all that effort doesn’t translate into results. If your prospects aren’t becoming clients, there’s a reason, which is better than it sounds because that means you can fix the problem. Top Agent to do so. Buyers should be able to picture themselves living in your home. While your Top Agent may not advise you to appear generic, you’ll likely need to thin out any shrine-like displays to family, hobbies or cultural interests. the paint, request a deep cleaning from your housekeeping service and weekly cleanings thereafter. Make sure they pay attention to details like dusting or vacuuming window treatments and lampshades or wiping smudges off door jams and baseboard moldings. 6. Carpets and Rugs: Bring in the pros, but don’t just clean the carpets. Because the cleaners will be moving furniture anyway, ask them stretch and tighten any buckled areas of carpeting. Doing so now saves the trouble of having to credit your buyer for this following final walk-through. Also consider removing small area rugs to let the beauty of your hardwood floors shine. will turn up their noses at the one with the broken hinges. Freshly replaced toilet seats, faucets or doorknobs in heavily trafficked bathrooms can go a long way in first impressions. 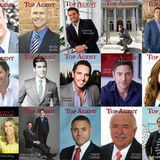 touches, ask them and your Top Agent for final recommendations on day-today upkeep, storage options and what-to-do (or what not to do) while your house is on the market.